Last night, tornadoes swept through the Dallas area leaving substantial damage and at least eleven people dead either from the storm or related traffic accidents. The National Weather Service in Fort Worth said several tornadoes touched down in the Dallas area, although the full extent of damage would not be known until daylight Sunday. The storm blew the roofs off homes and left vehicles mangled or turned upside down, churches damaged, power lines down, natural gas lines burst, trees toppled and debris strewn across neighborhoods. The damage stretched over about a 40-mile-long area from 20 miles south of Dallas to northeast of the city. Joe Harn, police spokesman for Garland, about 20 miles northeast of Dallas, said five people were killed in vehicle accidents during the massive storm, but it’s unclear if all five were in the same vehicle or how they died. CNN: Tornadoes, storms hit Dallas suburbs; 11 people killed. Severe storms and tornadoes tore through north Texas, killing at least 11 people in the latest incident of deadly weather in the nation. The storms hit Dallas suburbs Saturday evening, with Garland suffering the most casualties, authorities said. Lt. Pedro Barineau with the Garland Police Department confirmed Sunday morning that eight people died in the storm that ripped through Garland. Barineau said 15 people were hurt and 600 structures were damaged. Three additional deaths were reported in Collin County, said Lt. Chris Havey, a spokesman for the sheriff’s office. Havey said officials don’t expect the death toll to rise, but they are sifting through debris and making sure no victims were overlooked. In some neighborhoods in Garland, the storms ripped facades off houses, leaving gaping holes. Cars that had been in driveways ended up inside homes after the tornado barreled through, witnesses said. Officials said earlier that five of the deaths were related to vehicles hit by a tornado in southeast Garland. Garland resident Pat McMillian said the tornado left neighborhoods in darkness. UPDATE I: Death Toll Rises in Dallas as Storms Sweep South. At least 11 people were killed in the Dallas area Saturday night when 11 tornadoes swept North Texas, officials said. The storm tossed cars off freeways and destroyed at least one apartment building, a recreation vehicle park and several homes across the suburbs northeast of the city, according to officials with the Dallas County Sheriff’s Department and the Garland Police Department. About 50,000 people were without power, officials said. “There’s been quite an impact in damage and potentially injuries and death,” said Rich Thompson, lead forecaster with the National Weather Service’s storm prediction center in Norman, Okla. In Rowlett, which borders Garland, at least three houses had collapsed, and the people who lived in them had not been found, said Detective Cruz Hernandez of the Rowlett Police Department. Detective Hernandez said that the damage in Rowlett was extensive and that the police were seeking to rescue anyone trapped in their homes, although the effort was being hampered by continuing bad weather. “We can’t get a good sense of it because it’s dark and it’s starting to rain right now,” he said. On Sunday, Brian Funderburk, the city manager of Rowlett, said 23 people were injured when the city was directly hit by a large tornado. The city enacted a 24-hour curfew in areas affected by the storm to keep roads clear for residents and emergency operations. At least 7 were killed yesterday as deadly tornadoes ravaged the South from Mississippi to Arkansas to Tennessee. The severe weather caused tornadoes across the South, 12 alone were witnessed in Mississippi alone. According to reports, 24 tornadoes touched down across 6 states. As reported by ABC News, it will be a difficult Christmas for many families in the south after deadly storms and tornadoes devastated the region, especially in Holly Springs, Mississippi, where a 7 year old boy was killed. The devastation is beyond words. The mayor of Nashville, TN had asked businesses to let employees go hoe early to avoid the bad weather. When the tornado sirens went off late last night in Music City, thankfully it was mostly deserted. However, some were forced to take cover at the last minute as the severe weather came through. The winds and rain was incredibly severe and those not directly affected by the damage left in the wake of the tornadoes themselves, others lost power, including yours truly. Officials in tornado-ravaged areas were searching for missing people Thursday after a spring-like storm system swept across the southeast, killing at least seven people — including a 7-year-old boy. It was the first such warning anywhere in the country in a year and a half. The youngest victim of the severe weather was a 7-year-old in Holly Springs, Mississippi, who was killed in a van on Highway 7 as storms swept through the town, according to Marshall County Coroner James Anderson. Tree limbs and debris covered the highway Thursday, and emergency crews worked to restore downed power lines. Three people were killed and two others were missing in Benton County, Mississippi, county coroner Shane Ward said late Wednesday. The dead were two men and one woman, all approximately in their 60s. Crews were going house-to-house Thursday to make sure all residents were accounted for. The other victims were in Tennessee and Arkansas. A man and a woman were killed in Perry County, Tennessee, but no details were made public about their deaths. In Atkins, Arkansas, 18-year-old Michael Remus was killed when a tree crashed into the bedroom she was sharing with her 18-month-old sister. The toddler was taken to a hospital after being safely pulled out of the home by rescuers. UPDATE I: Search on for 3 Missing After Mississippi Storms. WOW … HEAVEN HELP THEM. Massive tornadoes hit Pilger, Nebraska. The National Weather Service said the two twisters touched down within roughly a mile of each other. Emergency crews and residents spent the evening sifting through demolished homes and businesses in the community of about 350, roughly 100 miles northwest of Omaha. At least 19 people were injured. UPDATE I: At least two people died and 16 were critically injured. Faith Regional Health Services said it had 16 people in critical condition. Three of the injured were taken to Providence Hospital in Wayne. Two were treated and released for lacerations while the third remained under observation in stable condition, according to hospital spokeswoman Sandy Bartling. “This is a significant storm, and one that I have never seen the likes of, ever. Really,” said Greg Postel, a severe weather specialist for The Weather Channel. 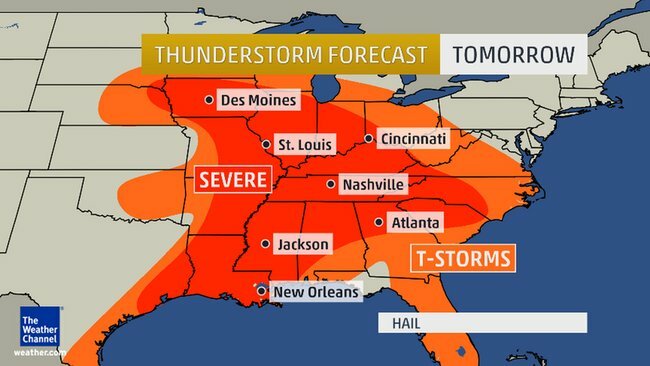 UPDATE II: Severe Weather Forecast: Tornadoes, High Winds, Hail to Continue Pounding the Plains, Midwest. TERRIBLE WEATHER HITS THE HEARTLAND … BE CAREFUL, TAKE SHELTER, BE SAFE. A tornado killed two people in the small northeastern Oklahoma town of Quapaw on Sunday. The deadly tornado struck Quapaw, which is near Oklahoma’s borders with Kansas and Missouri, at around 5:30 p.m. Six people were treated at the emergency room at Integris Baptist Regional Health Center in nearby Miami after the storm. There are reports that several homes have been hit in that community. A tornado also has caused “significant” damage in Baxter Springs, Kan., according to Gary Allen, a former Baxter Springs council member who also worked for the Cherokee County Sheriff’s Department. He said the tornado came into the city from the southwest and cut diagonally through the community. “There is significant damage to a lot of houses,” he said. Sunday was the third anniversary of a 226-tornado day, which struck parts of Mississippi, Alabama, Tennessee, Virginia and Georgia and killed 316 people. More video from CNN of tornadoes that touched down near Baxter Springs. UPDATE I: Tornado on the ground in Linn County, Kansas. Officials in the southeast Kansas town of Baxter Springs report several people injured by a tornado that also caused extensive property damage. About 75 miles north, Linn County emergency manager Douglas Barlet said some barns and outbuildings were destroyed but no one was injured when at least one tornado struck late Sunday afternoon near the Missouri border. UPDATE II: The risk of tornadoes continues on Monday and Tuesday, although the likelihood of strong twisters gradually lessens, according to forecasters. 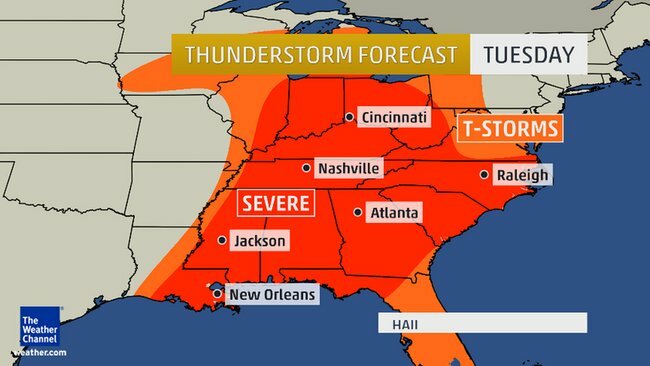 On Tuesday, however, the tornado risk moves as far east as the Carolinas and the western part of the Florida Panhandle, according to Weather.com. 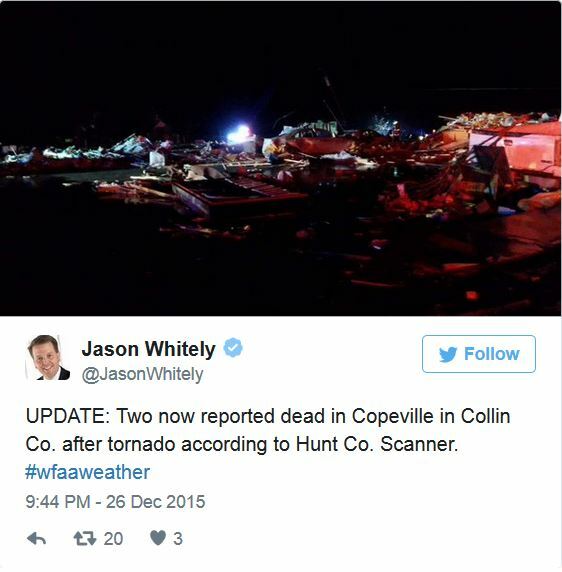 UPDATE III: Twisters kill at least 10 in Arkansas. Fierce storms spawned deadly tornadoes across the south and central U.S. on Sunday, leaving at least 10 dead in Arkansas and leaving a long trail of debris. Sheriff Andy Shock of Faulkner County, Ark., said at least six people in the county were killed, KTHV-TV in Little Rock reported. “It’s just devastating,” Shock said, adding that he expects the number to rise. Brandon Morris with the state Department of Emergency Management said one person is confirmed dead in White County, Ark., the television station reported. The twister carved a 30-mile trail of damage, and tens of thousands in central Arkansas were without power. Video from CNN affiliate KARK showed a decimated building in Mayflower, AR surrounded by scattered debris and emergency vehicles. Tornadoes tore through several states Sunday evening as severe weather slammed into parts of the central United States. Authorities confirmed at least nine fatalities: eight in Arkansas and one in Oklahoma. Damage is “widespread” after a tornado hit Mayflower, Arkansas, and there are numerous reports of injuries, said Matt DeCample, a spokesman for the state’s governor. UPDATE IV: Monday and Tuesday Forecast from The Weather Channel. Threat area: Severe thunderstorm and tornado outbreak continues in the regions illustrated in red within the inset map (right). This includes parts of the Mississippi Valley, Ohio Valley and the South. Hazards: Damaging winds, large hail and multiple tornadoes possible. Some tornadoes could be strong (EF2 or higher rating). Excessive rainfall could trigger flash flooding.Maximum TOR:CON: 7 in parts of Louisiana and Mississippi.Cities: Memphis, Tenn. | Nashville, Tenn. | Jackson, Miss. | Birmingham, Ala. | Louisville, Ky. Threat area: Severe thunderstorm and tornado outbreak possible in the regions illustrated in red within the inset map (right). This includes locations from the South to the Ohio Valley and southern Great Lakes. Hazards: Damaging wind gusts, large hail and tornadoes possible. In addition, heavy rainfall could trigger flash flooding. UPDATE V: Death Toll at least 18 as Tornadoes pummel Plains, Midwest, and South. At least 18 people were killed Sunday by three separate tornadoes spawned by a powerful storm system that moved through the central and southern United States. The Arkansas Department of Emergency Management confirmed early Monday that at least sixteen people had died after a tornado tore through central Arkansas, while an Oklahoma county sheriff’s dispatcher reported that one person had died in the town of Quapaw, near the state’s borders with Kansas and Missouri. Fox News has also confirmed that one person died when a tornado hit Keokuk County, Iowa. Series of tornadoes tear through Oklahoma city area killing 5 people and injuring many. The twisters turned the area in to a ‘war zone’. A total of 12 tornadoes hit the Midwest including, Missouri and Illinois around St. Louis, where numerous homes were damaged. The storm brought heavy winds, rain, death and destruction. The scale of the destruction wrought by five tornadoes that plowed through the Oklahoma City area became apparent in the light of day Saturday. Friday evening’s twisters killed at least five people and injured scores more, less than two weeks after a monstrous tornado made rubble of the town of Moore, a suburb of Oklahoma City. “There’s just no rest,” said city spokeswoman Kristy Yager. More from News 9 in Oklahoma. Dawn revealed the destruction of a deadly swarm of twisters that struck shell-shocked Oklahoma late Friday amid new fears about “life-threatening” flash floods. Five tornadoes — one a half-mile wide — ripped into the Oklahoma City area Friday evening, killing a mother, her baby and at least three other people. All five people killed were in vehicles and may have been trying to flee as dark clouds gathered and warning sirens wailed, authorities said.